MIAMI - Many parents have discovered that taking children on a cruise is an easy, affordable and fun family vacation experience. But there are also other valuable benefits. According to experts, a cruise vacation can stimulate creativity and imagination and help kids become more open-minded. As youngsters explore new places, have new experiences and make new friends, they gain confidence and begin to think in a whole new way, says Dr. Kate Eshleman, a Cleveland Clinic Children's child psychologist. "On shore excursions, kids have an opportunity to master skills that they perhaps have not done before," Eshelman says. "Certainly, when we feel successful in an activity, especially a new activity, that really benefits how we view ourselves and the things we can do. In the kids' club, meeting new friends increases independence and autonomy, which is also very beneficial." New experiences may even benefit kids' overall brain function. "It allows you to think in ways different than you perhaps had in the past," Eshleman explains. "You can revisit those thoughts in the future and that does expand your creativity." When planning a family cruise vacation, parents and grandparents may be thinking more about fun-in-the-sun and quality time, but cruises also bring educational benefits. "Families book excursions such as snorkeling that give everyone a close-up look at the natural world,"says Sherry Tierney, who taught elementary school for 30 years in Texas and Arizona and is now a home-based travel agent for Cruises Inc. "And by visiting ports of call, kids get a better idea of different islands and countries by seeing them firsthand. For kids and adults too, a cruise can be eye-opening." Exposure to new cultures, activities and foods is priceless educationally, agrees Gloria Stock Mickelson, a former high school teacher who now works for the travel agency organization Travel Leaders Network. "The youngsters expand their world view," Mickelson says. "On a cruise to the Caribbean or Europe or elsewhere, children gain an understanding that other people don't all do the same things. In other countries, people may eat differently, their music may be different, their dress may be different. Seeing all these things can be an invaluable experience." Complimentary onboard kids' programs – such as those offered by Carnival Cruise Line, Princess Cruises and Holland America Line – are increasingly putting a fun spin on learning. While parents enjoy relaxing at the pool or participate in other grownup activities, experienced youth counselors oversee play and happenings in elaborate playrooms and clubs. On the ships of Carnival Cruise Line, which hosts over 800,000 kids each year, the fleetwide Camp Ocean program for those ages 2 to 11 helps educate kids about the ocean. Younger children might make whales out of paper bags, while older kids design an aquarium or learn about buoyancy by building their own cruise ships. Teens and 'tweens have their own dedicated spaces and counselors as well. 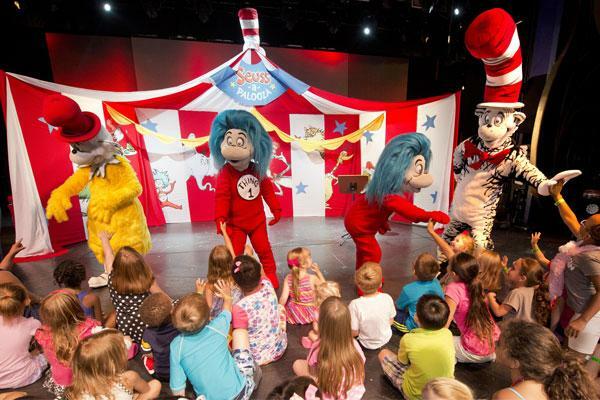 Carnival Cruise Line's Seuss at Sea program encourages the reading of Dr. Seuss classics through fun events related to popular characters – such as a Green Eggs and Ham Breakfast with The Cat in the Hat and Friends and a participatory character parade and story time. On the new 3,960-passenger Carnival Horizon, kids get wet under a giant tipping bucket and zip down waterslides at the Dr. Seuss-themed waterpark. In partnership with Discovery, newly redesigned Camp Discovery youth and teen centers on Princess Cruises ships provide a venue for kids ages 3 to 17 to learn about the natural world and discover new interests with fun activities, tied to popular Discovery TV programming. Included are hands-on science challenges developed in collaboration with Tory Belleci, star of the show "MythBusters," and an interactive Caribbean shark-themed scavenger hunt inspired by "Shark Hunters." Through the partnership, onboard and onshore activities for guests of all ages include "The Summer of the Shark," with shark-themed onboard programming, and Discovery Exclusive and "Animal Planet" Recommended shore excursions in destinations around the world. Holland America Line ships tend to attract more multigenerational families – grandparents, parents and kids cruising together. At Club HAL, for ages 3-17, youth coordinators lead such activities as arts and crafts projects based on the sailing destination. On ships visiting Alaska's Glacier Bay, a Huna Tlingit storyteller hosts special sessions for kids. On all three brands, kids under age 12 have the opportunity to earn an official Junior Ranger patch and certificate in a program operated with rangers from the National Parks Service. Kids also learn about the natural world through the cruise line's partnership with BBC Earth, with programming including shows and documentaries. Older kids on Holland America Line can learn how to make chocolate desserts and other treats at America's Test Kitchen cooking demonstrations. Kids interested in the nautical aspects of cruising will find longitude, latitude and other details direct from the ship's bridge on big screens in the state-of-the-art Explorations Center in the Crow's Nest Lounge. Youth counselors are also aboard most of the ships of ultra-luxury line Seabourn on summertime cruises in Alaska and Europe, offering programming for kids onboard on a more limited basis. Adults benefit from the opportunity to refresh and recharge on a cruise vacation, and so do kids, says Dr. Eshleman. And there is time for parents and their progeny, as well as extended family, to spend quality time together. "Taking that opportunity to connect is very important," Eshleman says. "You have time to really talk through things such as 'What did you do today?' and 'What did you think about snorkeling?' There's that opportunity to cement experiences in the family's memories." While your kids may be bugging you to spend money on the latest high-tech gadget, a family cruise vacation comes with longer-lasting benefits. Says Eshleman, "When you create a memory or experience, that's going to be with you forever." Αναρτήθηκε από geop στις 6:30 π.μ.